Saturday Sun gathered that APC leaders in the state including wife of the President, Mrs Aisha Buhari; Secretary to the Government of the Federation, SGF, Boss Mustapha; Chairman, Presidential Advisory Committee on Elimination of Drug Abuse, PACEDA, Gen. Buba Marwa; former EFCC boss, Nuhu Ribadu and a host of others had raised eyebrows before and after the presidential election about alleged secret working relationship between Governor Bindow and his benefactor, Atiku Abubakar who was the PDP candidate in the February 23 election. 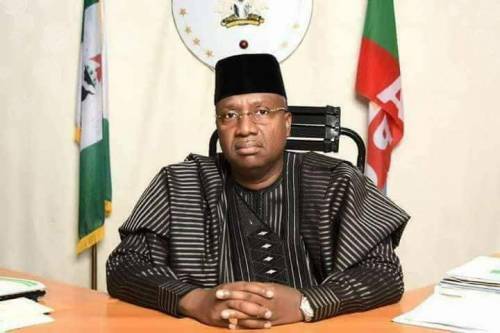 The Returning Officer of the governorship election, Prof. Andrew Haru- na, who declared the result late Thursday in Yola after the supplementary election in 44 units across 14 local government areas of the state, said Fintiri polled 376,552 votes to beat his closest rival, Gov. Muhammadu Bindow of APC, who scored 336,386 votes. He said that Sen. Abdul- Azeez Nyako of the ADC scored 113,237 votes to place third, followed by Chief Emmanuel Bello of the SDP, who garnered 29,792 votes. Fintiri was the Speaker of Adamawa House of Assembly in 2014,and also served as Acting Governor in July 2014, following the impeachment of the then Gov. Murtala Nyako.